Suitable for the packaging, shipping and storage of static sensitive items, there are many choices and styles of ESD foam available. 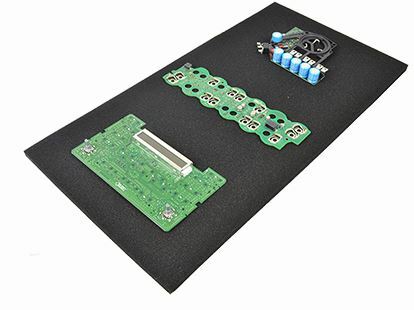 Stock sheets, rolls or custom die-cut foam inserts are commonplace in the electronics industry, available in both pink antistatic and black conductive. Pink antistatic foam is available in sheets and rolls and is best suited for short term storage and one-way shipping requirements. Pink antistatic foams are subject to humidity and the environment and will eventually dry-out or discolor over time. For a more permanent and long-lasting solution, consider black conductive or dissipative foams. Pink antistatic and black conductive foams are available in polyurethane, polyethylene and memory foam grades. Polyurethane foams are soft, open cell foams generally used for cushioning. Available in flat sheets and “eggcrate” style convoluted foam sets. Convoluted foam is supplied per set and is generally used in conductive boxes to protect circuit cards and electronic assemblies. Polyethylene foams are rigid, closed cell foams used for blocking, bracing, pin insertion and tote liners. Polyethylene foam is clean and low sloughing – excellent for die cutting applications such as ESD tote inserts, conductive case inserts and tool storage shadow trays. Conductive memory foam is a super-soft, extremely clean foam that is perfect for fragile and expensive components. This foam forms around and encapsulates the part providing excellent physical protection from shock and vibration. Conductive memory foam is featured in our PillowStat conductive plastic hinged containers and is also available in stock sheets. If you have any questions regarding ESD foam or ESD packaging, samples or custom applications, please reach out to us at 1-800-870-1199 or contact us at sales@correctproducts.com. We look forward to serving you! Previous Entry:Correct Products has Moved!